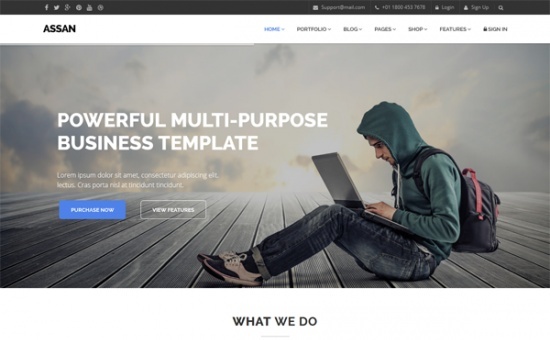 Assan is a Powerful, Responsive & Multi-Purpose Multi-Page & One-Page HTML5 Template. Build whatever you like with this Template. Be it Business, Corporate, Portfolio, Personal, Agency, E-commerce, Events, or Blog. just everything is possible with Assan. We have included 10+ ready-to-use Homepages & 80+ HTML Files with the Package, Amazing flexibility, Super sliders, Awesome Features & Sections, Bootstrap & Scalable Responsive Features makes Assan stand out from the crowd. Try out the demo.